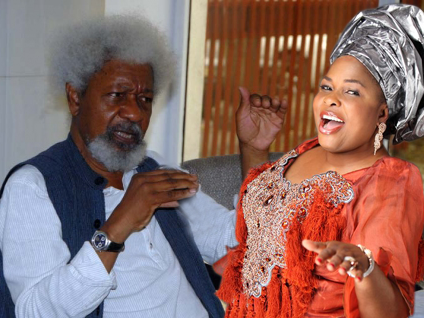 Some Nigerians on Sunday asked the wife of the President, Patience Jonathan, to make herself available for a debate with Nobel Laureate, Prof. Wole Soyinka.The call came on the heels of the diatribe the First Lady launched against Soyinka in which she described the renowned playwright as an “embarrassment” for attributing the crisis rocking Rivers State to her and her husband, President Goodluck Jonathan. But some Nigerians, who took to Twitter and other social networks to voice their concern over the development, called on a Lagos-based private broadcaster, Channels Television, to organise a debate for the two. According to them, the TV station’s Sunrise Daily, a news and current affairs programme that features prominent Nigerians, who are experts in their areas of specialisation, will provide a level playing ground for the duo to thrash out the knotty issues they were arguing on. To actualise their dreams, a cross section of them sent messages in a tweet to the handle of the programme @sunrisedailynow as well as the main official handle of the television station, @Channels_TV on Sunday. However, some users of the micro-blogging service boasted that the wife of the President would come out tops after the debate. One of such users of the social network who beat his chest on this was Yakubu Dogara who tweets via @doyakubu. Another Nigerian tweeting via @hobalawon said Soyinka, who clocked 79 on Saturday, should simply steer clear of joining issues with the First Lady and save himself from being on the receiving end of public bashing which he described as “lethal weapon” emanating from her. Meanwhile, the exchange of diatribe between the duo has divided Nigerians on social networks. While a section of Nigerians argue that the First Lady shouldn’t have descended heavily on Soyinka and that the onslaught was unpresidential, others maintained that Soyinka got what he deserved. However, those who believe that Soyinka deserved Patience Jonathan’s onslaught against him said it was wrong for Soyinka to insult another man’s wife in the first place. They noted that since Soyinka had descended into an arena of conflict, he could not avoid such a treatment.